This article has 5 pages. You're on page 5. 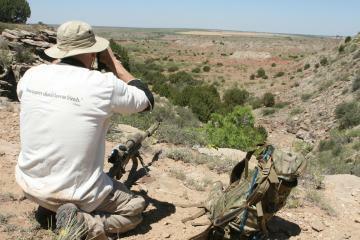 Target location is a key component of the Steel Safari challenge. Ray Sanchez tries to get a handle on targets on a stage on the North Course. I don't get a chance to shoot nearly as many matches as I would like to, so when I take the time I want to go to a class act. The Steel Safari is a great match. The amount of work that CMG goes through to place the steel and find challenging but practical shooting positions is much appreciated. The main draw to me for this match is that it is a field event. You leave the starting point in the early morning with your rifle, ammo, water, and gear for the day. The terrain is not terribly hard but out in New Mexico desert in 106 degree heat you have to pay attention to stay on the marked trial. We had a few guys go astray this year. For the field stages you had either three targets that would be engaged from two shooting positions or one shooting position with six targets. At each stage you had five minutes to find, range and engage the targets. The use of a quality LRF aids greatly in finding and ranging. Five minutes for six targets is plenty of time if you're squared away. Once targets are located and you start to engage them you better have good data for your load. Ten inch squares hung as diamonds out to 800 yards or so and four inch wide plates at closer ranges do not leave much room for error in your wind call - trust me on this one, I was shooting a 308. 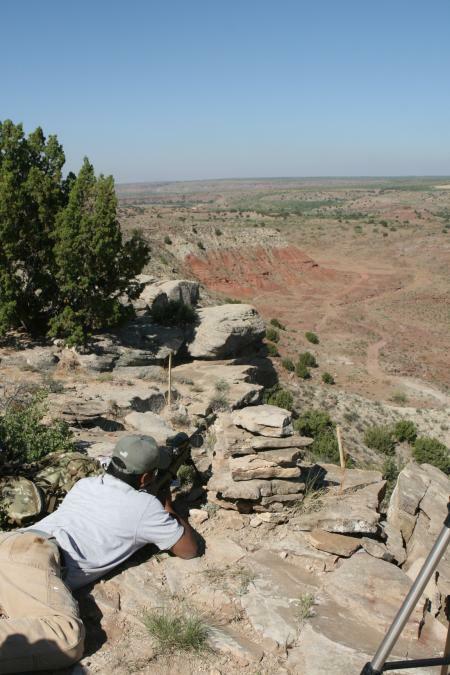 If you want to test your field shooting skills, get that expensive rifle of yours off the bench and maybe even scuffed up a bit: try your hand at the Steel Safari. This is not a match for posers, you get just one shot at each target so only hits count. The following sponsors made the match possible. Please give them your support and a note of thanks. The geographical features available to shoot from at the Steel Safari can be breathtaking. Shooter Jimmy Holdsworth engages one of the longest shots in the main match from this position on the North course.